Due to circumstances beyond our control, we have been forced to change the location of our 3rd Annual Regional Gathering of the Guard to Skyline Resort at Winterplace located in Ghent, WV (Exit 24, I-77). Rooms have been secured at the rate of $50.00 per night. Please call 304-787-6201 for reservations. If no answer, call 304-787-6210 after 1600 and speak to Alicia. When calling the main number, specify the Patriot Guard rate. We will have our Meet and Greet on Friday, 6 Jun, beginning at 1700. Entertainment will be provided. On Saturday, 7 Jun, we will have our Blessing of the Bikes and then depart on the “Ride for the Fallen” through some of the most beautiful scenery in Southern West Virginia. This group ride will be approximately 165 miles with lunch being provided at Summersville Lake. Ride will depart the motel area at 1000. Upon our return, we will be treated to a buffet dinner by Chef Bill Wolfe beginning around 1800. After dinner you are invited to enjoy the music provided by Taylor Made. All those attending are asked to bring a small item to be auctioned off. This event is open to anyone. All that is asked of you is that you remember what the PGR is all about, that being Respect for others and for yourself. Pre-registration is open until 23 May and is $30.00 per person or $50.00 per couple. This cost includes the buffet on Saturday and an event tee-shirt. Please use the form previously provided and make your reservations as soon as possible. 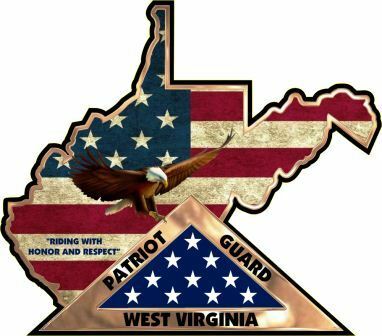 If form not available, e-mail our State Captain at WVSC@patriotguard.org or the event coordinator, Dave Rowan, at drowan64@aol.com and one will be provided. Make your plans now to come to Wild and Wonderful West Virginia for weekend that promises to be very enjoyable. Well, we have now “closed the book”, so to speak, on another successful Regional Gathering of the Guard. We were graced by the attendance of representatives of the West Virginia Gold Star Mothers and the Gold Star Fathers as well as by the National President of the Patriot Guard Riders, Robbie Smart and his lovely bride Patricia. By a vote of the BOD who were in attendance, proceeds from our event will be given to Wreaths Across America, divided equally between the West Virginia National Cemetery in Pruntytown and the Donel C. Kinnard Veteran’s Cemetery in Charleston for additional wreaths to be placed on the gravesite of our Veterans. While I know we all would have liked to see more in attendance, we are truly grateful to each and every one of you who were able to make it and we hope you thoroughly enjoyed yourselves. We cannot say enough about the hospitality and kindness shown to us by Jodi, the representative of Skyline Resort at Winterplace. While there were a few minor “bumps in the road”, as is to be expected, she was always right there to step in the smooth things over. This is an excellent facility in a very beautiful location! An event of this magnitude is never easy to organize and being forced to change the venue mid-stream only added to the headaches that go along with this. I think all will agree the “alternate venue” turned out to be a great choice. Our thanks to Susan Wiseman, HOTH Director-South, for locating this facility. To each one of you who assisted in the success of this event, I tip my hat to you and say thank you very much. Those who worked behind the scenes to prepare for this as well as all of our fantastic members who assisted in setting up the tables on Friday and Saturday, we cannot say “Thank You” enough. To Cindy Romano and the Nicholas County Vets for Life we offer our heartfelt “Thank You” for the fantastic meal you had prepared and waiting for us upon our arrival at Summersville Lake. There’s no way we can truly thank you enough. To Susan Whitlatch who worked so hard to ensure all who ordered a shirt or a hoodie had those available as well as the pins and decals for our store, I tip my hat to you and anyone who assisted you. A job well done! And finally to Dave Rowan, District RC and the main organizer of this event, I cannot commend you enough for the excellent job you did. Your job, while definitely not easy at times, was performed admirably. I personally thank you very much. I don’t think we could have asked for a better ride than we had on Saturday through some of the most beautiful areas of West Virginia. I hope most will agree when I say it’s easy to see why we are called “Almost Heaven”. Adding to the fact that you did most of this from a good distance away only serves to show your dedication to the PGR and our members. Bravo Zulu, brother. We now can turn our attention to the 4th Annual Regional Gathering of the Guard and would ask all of you to put your thinking caps on to choose the proper location for that event. As all are aware, we strive to move this around the state each year in the hopes of providing easier access to our members. These are all done for YOU and nobody else so if you think you’d like to see it held in your area of the state and are willing to undertake the responsibility of hosting, just let me know. If more than one of you steps up, a final decision will be made based on location and proximity to any of our previous events. Thank you all, once again, and may God bless each and every one of you.